Yes, people with pre-existing conditions should be protected. That is a hot issue on the campaign trail as Democrats hammer their Republican opponents over the threat that repealing Obamacare could mean citizens would lose pre-ex protections. But, like so many other things with Obamacare, the health overhaul law offers a promise but produces collateral damage in trying to deliver. While millions of people are helped by pre-existing protections and subsidies, millions more are facing premiums and deductibles so high that they can’t afford coverage for themselves and their families and are being driven out of the market. It also has failed to deliver in producing a sensible and sustainable mechanism to support pre-ex protections. After creating a temporary high risk pool that ended in 2014, it then permanently shoved their extra costs onto other Americans who are now struggling to afford coverage. Janet reports, “In 1999, I was diagnosed with Hepatitis C, which made me ineligible for insurance (denied for pre-existing conditions). I live in Colorado, and they had a high-risk pool that covered people like me. I applied for that and was accepted. When Obamacare went into effect, Colorado’s high-risk pool was closed. “I was forced into the regular marketplace that everyone was telling me was a good thing because I couldn’t get denied. I think my first year on that policy, my premiums were in the $450 range—which I thought wasn’t too terrible, but still more than I had been paying. “The thing I noticed from the start was that instead of full coverage, almost everything I needed was denied, which threw me into the world of having to appeal (sometimes several times) to get the basic care I needed. “Since then, my premiums skyrocketed. In 2017, I paid $735 a month with total out-of-pocket costs of $5,500. In 2018, my premiums went up to $1,100 a month with a deductible of $6,300. Once I hit that mark, I’m covered 80%. “Further, none of my anti-rejection meds are on the formulary of my insurance. If I could not afford them, my body would most certainly reject my liver, causing another liver transplant that would not be covered 100%. “I don’t get any credits from the government to reduce my premiums. Those of us who are self employed but make more than the threshold for tax credits wind up footing the whole bill ourselves. I have to spend $19,500 before my insurance pays anything, and it doesn’t cover all my prescription costs. My old plan was almost a third of what I have to pay now. “I have many friends and work associates in the same boat as me. Many of them are doing without insurance and are betting that they won’t need more than what they can afford to pay out of pocket. I cannot do that, because if something happened and I needed another transplant, it would bankrupt my family. Janet has coverage for pre-existing conditions, but her access to care is worse and the cost of her coverage is much higher than before Obamacare passed. Partly as a result of Obamacare’s hollow promises, people in half of the counties in American have a “choice” of only one plan in the individual and small group markets, and they face prohibitively expensive premiums. Conservatives from the beginning have talked about repealing AND replacing Obamacare. What’s needed is a plan that provides both a promise and a way of fulfilling that commitment. Washington has shown it is unable to manage something as complex as health insurance markets. We need a new reform plan that will help everyone, including those with pre-existing conditions as well as those with high health care costs. 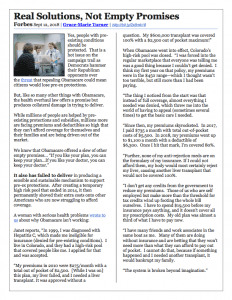 States have much more experience in overseeing insurance markets, and our Health Policy Consensus Group, which I facilitate, has developed the Health Care Choices Proposal to provide states with greater flexibility and additional resources to help their citizens, including those with pre-existing additions. Our plan would provide dedicated funding so they can help those with pre-existing conditions as well as families who are being hammered by high health costs so both groups can get and keep coverage. We want Sen. Reeves’ constituent to be able to be able to afford coverage for his family. And we want Janet to be able to purchase coverage that she could afford and be able to find a doctor to treat her. Several states have devised ways to redirect Obamacare funds to provide more help for those with high health costs while reducing premiums for others. They use public resources to offset the highest-cost claims so insurance is more affordable for healthy and middle-income families. Obamacare’s empty promises are continuing to do harm to our health sector and to Americans who need help. We need instead the plan that will provide real solutions, not empty promises—the Health Care Choices Proposal. Janet needs extra help with medical expenses. Putting her into the same insurance pool with everyone else means her special medical needs aren’t being met and that she, along with everyone else in the pool, must pay higher and higher costs for insurance. Under the Health Care Choices plan, Janet’s state of Colorado could revive the high-risk pool that worked for her before Obamacare. Or the state could create new ways of providing extra help for people like Janet with expensive medical conditions so she can get the medicines and treatment she needs while keeping her premiums and deductibles at a more reasonable level for her and others. 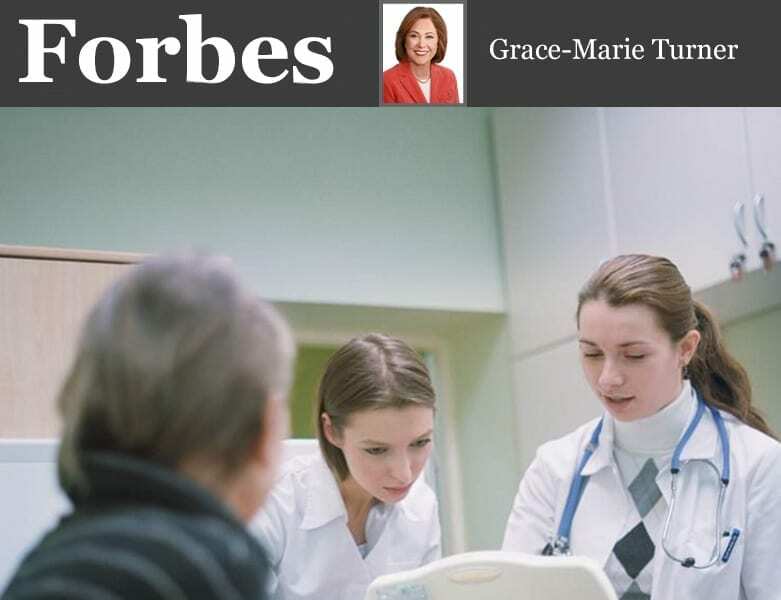 Under our plan, states would need to show that a fixed percentage of the grant money is being spent on those with greater health care needs. Obamacare does not do this. And our plan does. We believe there are better ways to help people with pre-existing condition than the failed and flawed health overhaul law. We need a new generation of reform that relies on the experience of states, with new formula grants to help them support those who need help in purchasing coverage and provide real protection for those with pre-existing conditions.